Designed for the NeuraLabel 300x printer. The NeuraLabel NoTouch™ Unwinder/Rewinder System (NoTouch™ UR) incorporates state-of-the-art media sensing technologies that allow for a simple unwinder/rewinder unit. With an exceptionally small footprint, the unit is easy to move, set up, and use. The NeuraLabel NoTouch™ UR uses optical sensors that monitor media movement for both unwinding and rewinding systems. Programmable sensors monitor data and use control algorithms to determine the appropriate media speed for both input and output rollers. Powerful geared stepper motors move the unwinder and rewinder hubs at the appropriate speeds based on input from the control module. The result is a smooth unwinder/rewinder system that gracefully handles your rolled media throughout the entire printing process. 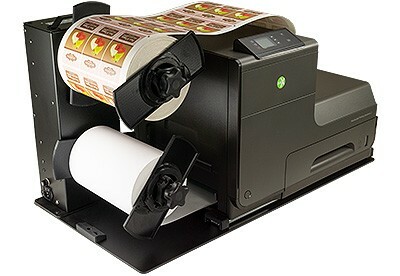 The NeuraLabel NoTouch™ UR integrates readily with the NeuraLabel 300x label printer or can be configured to work with other production label printers.